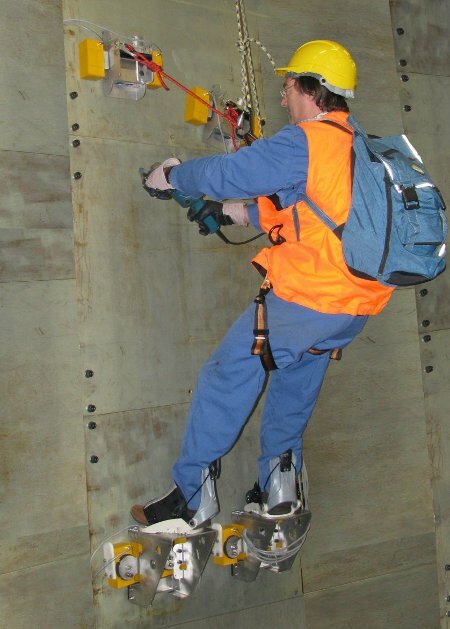 Cling Climbing’s climbing method uses “Electro Permanent” magnets for all four limbs. The operator turns off one of the magnets, moves it to the next position, and turns it back on again, allowing him to move both up and down and side to side, albeit somewhat slowly. The “climber” can also tie himself to the handholds so both hands are free to work. It doesn’t appear that Cling Climbing’s magnetic climbing system is ready for production yet, but even if it was available you probably couldn’t buy it off the shelf. For further information, you’ll need to contact the company. Yeah. You first. I’ll be at the bottom with the body bag. What’s fascinating about electropermanent magnets is that they only require power to turn on or off, so if the power is interrupted, you don’t plummet to your death. Question: If you can get a safety line down from up top, wouldn’t it be easier to lower a guy into place rather than have him climb up? …or hoist him up if the line is controlled from the ground? Wonder how much all that stuff weighs. I think the point of this tool is not climbing, but rather having a stable platform to perch upon once you are in position. Look at the picture — would you want to be using that angle grinder while dangling from a rope? Ah. I guess I got thrown off by the company’s name. Why maximum thickness? I would think it would want a minimum thickness to carry the magnetic flux w/o saturating (limiting force), not a maximum. I thought the same thing, I just reported it like I read it. My theory is it was mistranslated. Most of the copy reads like it was translated from another language, German in fact. Many of their press releases are also in German. My other theory is that maybe they can’t shut the magnets off if the material attracts too well. I can’t find much info on how electro permanent magnets work, but evidently you can turn them on or off by applying current. Maybe if there’s too strong of an attraction the field can’t collapse?